Former RNC Chairman Michael Steele: Conventions Like "Infomercials"
“You have to understand what these conventions are designed to do, they’re largely infomercials." Former RNC chairman Michael Steele likened national conventions to infomercials, saying the conventions are nothing more than a showcase for candidates to fine tune their message and lay out their vision. 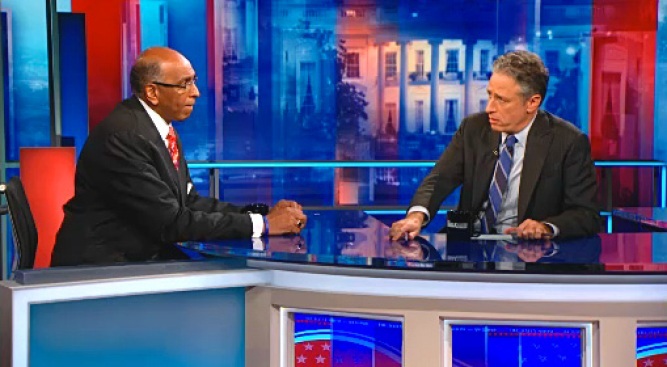 Michael Steele, the former chairman of the Republican National Convention, made an appearance on Thursday’s episode of “The Daily Show” to talk Paul Ryan, the RNC, and how national conventions bear a striking resemblance to infomercials. Host Jon Stewart kicked off the segment with an assessment of Rep. Paul Ryan’s acceptance speech the other night. Painting Ryan as the “intellectual soul of the Republican party,” Stewart said Ryan’s speech was lacking the boldness and hard truths he had become known for. “For a guy with a reputation of being, from what everybody says, a straight shooter, a guy of hard truths that played so fast and loose with context and facts, did that surprise you?” Stewart asked his guest. Ryan’s acceptance speech drew some heavy fire from critics for its inaccuracies and factual shortcuts. “Is it if you stand near Mitt Romney you are automatically deluded?” Stewart quipped. Steele, who earlier lauded Ryan’s boldness, came to his defense, likening modern national conventions to three-day infomercials. The conventions, Steele explained, provide a showcase for candidates to lay out their vision and fine tune their message.